"Thank you so much for the quick shipping. I really appreciate it. That is why I buy from you, besides the fact that your stains are the best ever for interior projects I make for my daughters and you care about the customer. The latter is something I find lacking the more I shop online and it is disappointing to say the least." "Thank you for your assistance. I have to tell you that your company has the very best customer service that I have ever seen. Thanks again and have a great weekend." "Wow! Talk about customer service. You are tremendously helpful. Thank you so much!" "I just wanted to tell you how much I appreciate your help getting this cedar shelf made for our closet. The shelf is absolutely beautiful and exactly what I was looking for.. Thank you!!" "I received the vents yesterday and WOW, they look amazing! I am so happy with them and can’t wait to start painting. Please tell whoever built them that they did a fabulous job and they look exactly like the picture I sent! I’ll be sure to send you a picture once they’re finished." "I am happy to report that my mailbox arrived and has been put up today by my son-in-law and it looks great. Thank you for staying on top of this for me!" "Holly, everything arrived on schedule, the dog house is up and so is the mailbox. We are very pleased with both. Thank you for your help with this order. You really helped my experience with Adams an enjoyable one. "Thanks for all your help and keeping me informed along the way. Your customer service is outstanding!" "Thank you so much for your prompt response.....I will contact you again in the spring. Thanks again for your excellent customer service." "So far our deck box is fitting our needs. You all were EXTREMELY easy to work with and I especially appreciated the communication with you. All of my questions were answered up front. Thank you." "I was looking for American made and quality dog houses for my Black Lab. After researching many sites, I settled on you and I am glad I did. Your service and attention were just perfect. Becky helped me with my transaction and even sent me extra parts that I accidentally threw away. Your wood dog houses are fantastic and I appreciate they are not made where people eat dogs. I purchased the small insulated dog house (red cedar)....Thanks!" "My new red cedar dog houses just arrived dog house. I was hesitant about the higher price than imported dog houses, but I decided my dog was worth the extra money. I am sure this house will stand up to the harsh weather in Michigan. Your company made good on the product, service and delivery! No small feat in today's world!" "Excellent doghouse. Shipped fast with no problem at all. My dog is very happy. Both he and I would recommend ADAMS." "I ordered a dog house (red cedar) from Adams. It arrived exactly when they said it would. The quality of the product was every bit as good as they purported it to be. It was easy to assemble and it looks great. I would highly recommend these guys to anyone. Top notch vendor." "We liked the 3 planters we ordered from you some months ago that we decided to get 2 more to complete the deck area. Quality of product most important element in our purchase consideration. ADAMS makes great planters." "I entered the wrong zip code when I placed this order and was sure it would delay things .... I emailed them and it was fixed immediately - something a lot of companies can't do (change the order after it's in the computer). Item arrived with several days to spare, safely packaged in managable cartons and with everything necessary to get it put together. A great company to deal with and a quality product to boot! I'm very happy with this merchant." "We were very pleased with the product and the service. Our potting bench came on time, looked like the picture and was very easy to put together. The price was excellent and the quality was actually better then we were expecting. We would definitely order from them again"
"I was very impressed with the quality of the products I purchased. The assembly and installation was a breeze, and I have received numerous compliments on the arbor. I will be purchasing more products from Adams." "Thanks a million for timeley and friendly customer service. Beth took my order by phone for a teak deck box and walked me through the differences in price and value. I product arrived on time and exceeded my expectations. 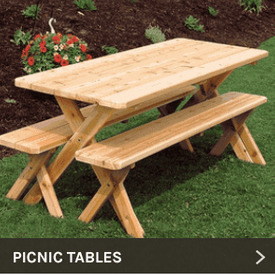 I'd recommend Adams to anyone for all outdoor furniture and cedar wood products." "Thank you, Holly! I am so happy...you and your staff have been so wonderful. Going to spread the word about Adams All Natural Cedar!" "...thank you for your timely response. The craftmanship on the cabinet is excellent." 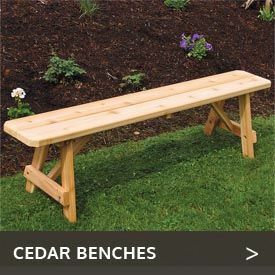 " I purchased a cedar bench for my deck and the quality is outstanding. Thank you very much." "Timely and well packaged shipment! I was able to add a pet mat to my shipment after my original order and received help by phone with some questions I had about my order! I recommend this product for a responsible pet owner and would purchase any product from Adams with confidence!" "We initially purchased a 4-ft. swing. After receiving it, we determined that we needed the 5-ft swing. Adams was very prompt in allowing us to return the 4-ft. swing and the new swing was delivered shortly thereafter. We appreciate the service we received. The swing appears to be a quality product." "Jovi loves his Adam's doghouse (Godzilla). The heater works great! and the a/c too....and It was easy to put together...Here's some pics (1 & 2 & 3) of Jovi (6 months old)..the DEAF and mostly white, blue-eyed (Merlequin Great Dane)." "Thanks to all who helped with the ~Walk in the Garden~ Adam's cedar arbor project. Who would have thought all those pieces of wood would turn into something so beautiful??!! Of course, the "craft queens" came through with the fabulous clay and copper embellishments....Thank you to all who helped to make this project a reality and to Mr. and Mrs. C. for giving it a good home! :) "
"I ordered a dog house and heater from Adams because of their great phone service and explanation of the product. This dog duplex is top notch." Click HERE to meet a happy dog house recipient named "Leo" expressing his point-of-view! "This experience exceeded my expectations: 1. The site was well-done, and easy to navigate. I was able to find all the information and answers I needed. 2. When I emailed them to inquire about a delay in the order, they responded quickly with an explanation and expected ship date. 3. They packaged the product extremely well, and used UPS, which is quicker and more dependable, and they offered free shipping, which was a big factor in my decision to try them. 4. As to the product, the cedar planter boxes they are beautiful quality, and the option to have them pre-treated with oil finish is a real bonus. They look GREAT!" "Packing tape was almost all torn away on arrival but everthing was still in the box. Office staff was very quick with a response to a question and overall they were really together. The Outdoor Chaise Lounge was as advertised." "Katie, thank you for taking care of me. You are a dear. Hopefully I do not have to bother you again until I need more furniture. Please show this email to your supervisor and management. I want them to know that you are solely responsible for making a challenging situation tolerable. Because of your efforts we are in fact enjoying what we have received from your company. Good job." 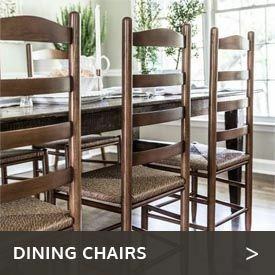 "No problems, seems to be very much interested in what the customers think...good..."
"The price was right, the furniture arrived quickly, well packaged. There were even a dozen extra assembly screws--a nice touch. My inquiry on date of arrival of the furniture received a next-day answer. I could not be happier with this store." "Thank you to everyone involved with handling my order. From the quality of the products, to the speed of delivery, and to the excellent customer service; it is easy to recommend doing business with Richey and Holly and everyone else. Thanks again." "I had a shipping problem with UPS so I contacted ADAMS and Tina was wonderful and kept me informed of the progress." "I've never bought from ADAMS before. Mine was just a tiny order, inconsequential in the annual sales volume at ADAMS. But it was treated the same as big orders, and arrived in good condition in very timely fashion. I look forward to doing business with them in the future." "Great potting bench. It arrived on time and was easy to assemble. I look forward to getting info on more of their products." "I was notified of a delay in shipping and the product was delivered by the new delivery date I was given. I ordered a cedar potting bench and the product description said I would also receive a mixing box, which did not arrive with the bench. I emailed Adams and they replied promptly that the manufacturer's description was incorrect, but they agreed to send me the box at their expense. They did this immediately. Overall a wonderful internet shopping experience! (and I have had my share of bad ones!) "
".....Your customer service turned out to be exemplary...thanks again." ".....As far as customer service and communication YOU WERE EXCELLENT! It was a pleasure doing business with you and I would order from your company again in a heartbeat! I will get back with you in regards to the design and quality of the table just as soon as I assemble it which will be hopefully, with in the next week. Thank you again!" "Thank you so much for the awesome customer service your entire company has provided. I'm sitting on my front porch in great anticipation of the box delivery :-). Thank you and cheers to you." "Holly has been a great help and answered my 100 questions. Thank You!"